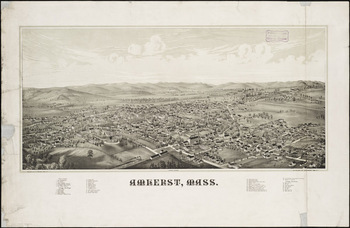 Lucien R. Burleigh published the Amherst Bird’s Eye View map in 1886 Burleigh’s Amherst map looks from the southeast corner of town toward the west. Pictured in the foreground are Amherst College, the railroad depot, and East Village. Further back are Amherst’s central business district, the Amherst Hotel, and the town common. In the distance can be seen the western edge of Hadley farms and the Massachusetts Agricultural College (UMASS). Lucien R. Burleigh was a civil engineer, lithographer, and publisher from Troy, New York whose company, Burleigh Lithographing Company, specialized in printing panoramic maps and “views of buildings and villages”. During the 1880s, Burleigh's views of New York and New England were particularly popular. Panoramic maps, which became popular during the late nineteenth century, depict entire towns and cities (including street patterns, individual buildings, and major landscape features) in perspective and are drawn as if viewed from above at an oblique angle. Panoramic mapping of urban centers was unique to North America in this era. Most panoramic maps were published independently, not as plates in an atlas or in a descriptive geographical book. Preparation and sale of nineteenth-century panoramas were motivated by civic pride and the desire of the city fathers to encourage commercial growth. Many views were prepared for and endorsed by chambers of commerce and other civic organizations and were used as advertisements of a city's commercial and residential potential. Preparation of panoramic maps involved a vast amount of painstakingly detailed labor. For each project a frame or projection was developed, showing in perspective the pattern of streets. The artist then walked in the street, sketching buildings, trees, and other features. These features from the sketches were then drawn on the frame in his workroom to present a complete and accurate landscape as though seen from an elevation of 2,000 to 3,000 feet. --Adapted from: "Panoramic maps". Library of Congress. Reps, John W. View and Viewmakers of Urban America. Columbia, Missouri: Univ of Missouri, 1984.